The ULTIMATE Poshmark Bot & Automation package. Buy all products together and dominate Poshmark by utilizing the most advanced Poshmark bot features on the market today. The Best Poshmark Bot On The Market. More human like sharing, generates a random # of seconds between each share. Share back anyones listings who have shared yours. Specified # of people by YOU. Our most exciting feating feature allows the 2captcha.com API to solve captchas permanently, you now do not have to wait by the computer anymore! 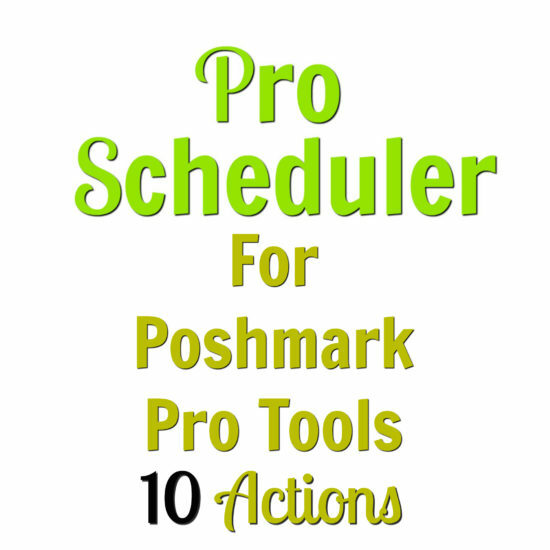 Poshmark Pro Leads is included with Poshmark Pro Tools SUITE’s other products. With “Poshmark Pro Leads“, you don’t EVER have to wonder if people are actually interested in your listings. Because they already are. Imagine being able to build your closet’s following according to what brands you sell, imagine the potential for sales. Bring the products to your (potential) customers! Poshmark Pro Leads will find Poshmark listings with your keyword (or brand) in any part of it. 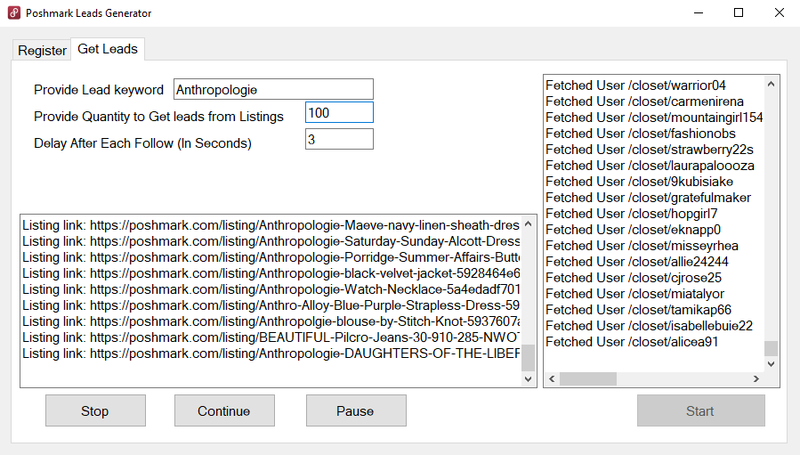 Type in a Keyword in the search (Anthropologie, Gucci, Prada, Coach… ETC). You get targeted, ready to buy followers. Selling on Poshmark is now easier than ever! A different Poshmark Bot than anything out there right now. If you want to know the secret of how to sell on Poshmark, then read on. Anyone will tell you, if you want to make sales, then you need traffic. And getting targeted traffic on a sales platform such as Poshmark can be difficult. It is PROVEN! If you want to sell to alot of people, you need to TARGET what they want! How do you do this? By checking out listings that are featuring the brand that you are selling and looking at the… Are you ready? ENGAGEMENT! What do I mean by engagement? If I see a Nike shirt I really like, usually 9 times out of 10, I’m going to end out clicking the like button, or post a positive comment. But, what’s really going on in my head? Being that I am interested, this is going to make me that much more likely to make a purchase. How will Pro Leads boost my selling on Poshmark? And this is where Poshmark Pro Leads with actually take you and SPOON FEED you serious buyers who are looking to spend money on the items that YOU are selling! The people you will follow have already made some sort of interaction with the keyword (or brand) you have inputted. Giving you a headstart, and having to “sell” to them less. You will never have to sit and follow people manually all day, Pro Leads will do that for you. Your account will be secure because you can set the follow rate manually! Captcha will pause the software until you take care of it! Become one of the top sellers on Poshmark! 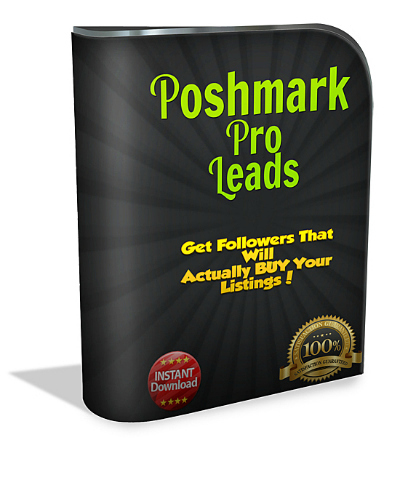 GET THOUSANDS OF TARGETED, READY TO BUY, POSHMARK FOLLOWERS! If you want the power to sell on Poshmark, with EASE. Then you need Poshmark Pro Leads. Its original design makes it one of the most powerful Poshmark bots on the market. We should be charging hundreds of dollars. BUT. We are all in this together. And trust me, I came from humble beginnings when it comes to selling on Poshmark, and other websites like Poshmark. That’s why I’m not charging you 100’s of dollars for this software. Im not even going to charge you $100. In fact, because I want you to succeed, Im going to let you try it for ABSOLUTELY FREEfor 3 days! You have NOTHING to lose, and only money to make! I’m confident that you will decide that you absolutely love the software because of it’s ease of use, but I want to make it easy for you! So… go ahead and jump on board and grab your trial version, absolutely free RIGHT NOW inside this SUITE! You can also purchase a license separately and it will unlock it inside the SUITE, ready for you to use at a moments notice. You deserve time. Get a Poshmark Bot. Let Poshmark Pro Tools SUITE gives you just that!